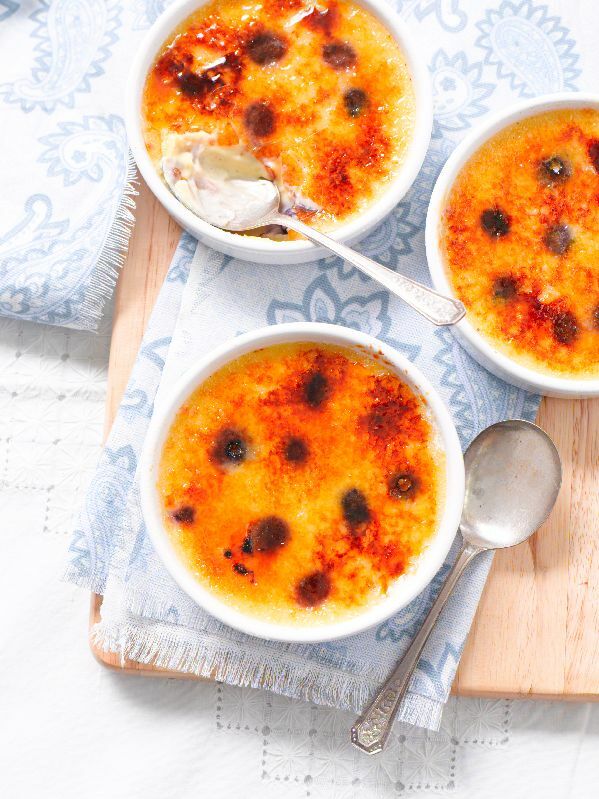 Crème brûlée is a favourite dessert for many people. This sublime white chocolate version, studded with blueberries, makes this divine dessert even more desirable. 1 Scrap seeds from vanilla bean and place in a saucepan with cream. Bring just to a simmer (don’t boil) then remove from heat. Add the white chocolate and set aside to melt. Stir until smooth. 2 In a heatproof bowl, beat egg yolks and sugar until creamy. Stir in the warmed cream mixture. Set bowl over a saucepan of gently simmering water and stir until mixture forms a custard thick enough to coat the back of a spoon (this may take up to 10 minutes). 3 Heat oven to 160°C. Pour custard into six 180ml capacity ramekins. Scatter each with a few berries. Place ramekins in an oven pan; fill pan with hot water to come half way up the sides of the ramekins (the creates a water bath). Bake 20-25 minutes until just set. Remove and cool then refrigerate overnight. 4 When ready to serve, heat a grill on high. Sprinkle the sugar over the surface of the custards and place under the grill until the sugar caramelises. Or, if you have one, you can use a culinary blow-torch to caramelise the sugar. Chef’s trick: It is best to prepare the white chocolate custard studded with blueberries the day before. Then when you’re ready to serve, all you need to do is caramelise the sugar crusts and enjoy!